The higher fire risk in the tropics is one of many of El Niño's impacts that scientists are observing. In rain-starved California, models are projecting that the weather phenomenon, which is the strongest seen since 1997-98, will likely include heavy precipitation beginning in mid- to late December. The heavy precipitation will be triggered by "atmospheric rivers," which are weather patterns that bring storms to the West Coast of the United States. The rivers are projected to be warmer and wetter than normal this season. Still, the deluge would likely not quench the four-year-long California drought, said Martin Hoerling, a research meteorologist with the National Oceanic and Atmospheric Administration's Earth System Research Laboratory. "It is too simplistic to talk about drought busters about being just about rain," Hoerling said. "You have soil moisture and groundwater that has been depleted over decades that isn't going to be recovered no matter how much it rains." 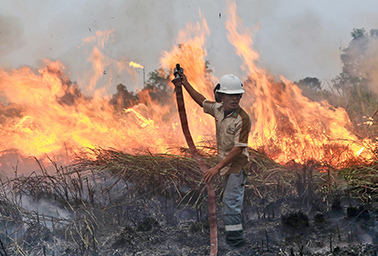 Wildfires in Indonesia that ignite peat bogs and forests and cast a smoky haze over the whole region are among the many impacts of the current El Niño. Photo courtesy of AP Images. "We see depleted moisture in the forests of Indonesia, and that allowed the fires to expand," Randerson said. "We've also seen a reduction in moisture across the Amazon -- this is the threat for 2016." There is still some hope for the southern Amazon forests, where fire behavior is also dictated by the Atlantic Ocean. Scientists will be watching that ocean basin carefully to assess next year's fire threat, Randerson said. El Niño's effect on California rainfall is not that straightforward. Two of the wettest years in the state's history occurred during El Niño years, but so did two of the driest years, Hoerling of NOAA said. "Strong El Niños do greatly increase the odds of wet conditions for the state," Hoerling said. Much rainfall in California is caused by atmospheric rivers, which are responsible for 40 percent of the state's annual precipitation (ClimateWire, Dec. 18, 2014). Duane Waliser, a scientist at the Earth Science and Technology Directorate at NASA's Jet Propulsion Laboratory, analyzed historical data of atmospheric rivers and found that the present El Niño may not increase the number of rivers that occur in 2016.